LaTienda.com hosts a giveaway of signed soccer jerseys by Xabi Alonso of Real Madrid CF and Carles Puyol of FC Barcelona. Barça vs Madrid: Which is the best? LaTienda.com announces a giveaway of jerseys signed by soccer superstars Xabi Alonso of Real Madrid CF and Carles Puyol of FC Barcelona. Fans are welcome to vote for their favorite team and need only provide a valid email address to enter. 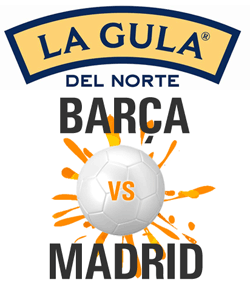 Sponsor La Gula del Norte has provided the coveted jerseys and has recently launched a product campaign featuring Xabi and Puyol in a video dining together on delicious La Gula Del Norte seafood. Fans will have the opportunity to win the signed jerseys from the team of their choice. “We are avid soccer fans, and our La Tienda employees have divided loyalties – some support Real Madrid and others support Barcelona. We had to be sure when we developed this concept that we represented both teams evenly. We are delighted to share this giveaway opportunity with our customers and with the public!” noted President, Jonathan Harris. Xabier "Xabi" Alonso Olano is a central midfielder from Toloso, Spain who plays for Real Madrid. Carles Puyol i Saforcada, who plays for Barcelona, is best known as a central defender and is native to Lleida, Catalonia. Hailing from two of the largest cities in Spain, these teams have a passionate rivalry stretching back many years. With El Clásico scheduled for March 2nd, excitement is steadily building for the fans of both Real Madrid and Barcelona. This year’s match will be watched by millions of people worldwide. The last day to enter the giveaway is May 31st, 2013. The winners will be selected and notified via email. Each soccer jersey is signed and framed and will be shipped by La Tienda to the lucky winners within two weeks of the drawing. LaTienda.com is able to ship the prizes to entrants from anywhere in the U.S., Canada, Puerto Rico, Guam, as well as all APO/FPO/DPO destinations.